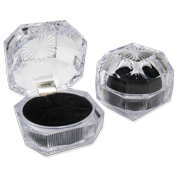 Shop the best lucite gift boxes and showcase your pieces in style with our Crystal Clear Line! Perfect for retail sales and packaging, these boxes have an elegant feel thanks to the acrylic top & cotton fill. Get the best deals with our wholesale discounts!